The Croma Select E Vario Thermostatic Shower System offers elegant design, amazing functionality and reliable quality. 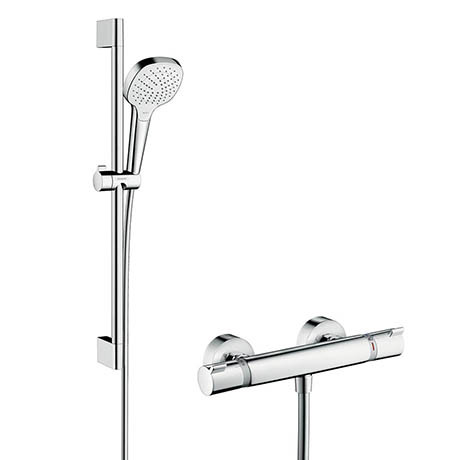 This complete shower system adds a touch of sophistication to any bathroom. It features 3 spray patterns: Rain - perfect for rinsing shampoo out of your hair, IntenseRain - perfect for setting yourself up for the day washing morning tiredness down the drain, TurboRain - a revitalising, powerful spray providing a refreshing shower experience. The QuickClean rub clean nubs loosens any limescale deposits making sure your hand shower looks beautiful, and stays working for longer.